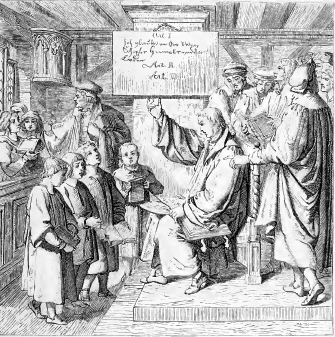 Luther instructs children from the Small Catechism. The work of the Reformation began in 1517 when Martin Luther posted his 95 Theses about indulgences on the door of the castle church in Wittenberg. During the fall of 1528, while visiting congregations in Saxony, he witnessed with bewilderment the terrible religious ignorance of most people, including the pastors trained for ministry prior to the Reformation. For them he wrote his Large Catechism based on a series of sermons he had delivered that year. At the same time appeared his Small Catechism designed for laypeople and especially for school teachers and heads of households. It was first printed as single posters with the text and explanations of the Ten Commandments, the Apostles’ Creed, the Lord’s Prayer and the Sacraments, as well as a set of daily prayers. Posted on the walls of churches, schools and homes, they were a practical and educational way to remind Christians of Christianity’s basic truths. In May 1529, The Small Catechism was published as a book. The second edition appeared a few weeks later, followed before summer by a third edition, and many more. The Small Catechism is the personal work of the Reformer, the fruit of his preaching, designed for the humble, modest Christians. It explains in simple, easily understood language the truths revealed in Holy Scripture. The book begins with the Ten Commandments and their deep spiritual meaning, expressing God’s immutable will. They are followed by the three articles of the Apostles’ Creed which teach the work of the Father, Son and Holy Spirit, the Creator and Redeemer of the world, and He who leads and strengthens the Christians in the knowledge of and faith in the divine truths. These explanations are especially beautiful and invite believers to personally apply the Gospel promises and to live under them. In the third part Luther shows the beauty and richness of the Lord’s Prayer, so that reciting it might not be a simple rite performed automatically, but become the expression of genuine adoration, faith and confidence. In the chapters dealing with Baptism and the Lord’s Supper the Reformer presents the sacraments as authentic means of grace in which God offers to those receiving them with faith, the forgiveness of sins and eternal life. In a chapter entitled “Confession” Luther speaks about confession and absolution and shows the benefits which believers receive from them when he recognizes the pastor as God’s spokesman and that the absolution he pronounces is as true and valid as if the Lord Himself had spoken it. Each statement is clearly enunciated and based on Bible texts to show The Small Catechism truly teaches the Word of God. At the end of the book, after several prayers for the morning, at table and for the evening, there is a “Table of Duties” which reminds Christians of their duties according to their status in society and the responsibilities with which they have been entrusted. A section called “Christian Questions and their Answers” helps Christians examine themselves and thus commune worthily, acknowledging and confessing their sins and checking the sincerity of their faith. In a rather lengthy preface, Luther states why he wrote this booklet and how he wants it used. He would like fathers to act as “domestic priests,” carrying out their spiritual responsibilities, working closely with the pastors and school teachers. He insists on the need to memorize these fundamental texts so they might permeate the spirits and hearts of the children. Although The Small Catechism is nearly five-hundred years old, it has lost nothing of its youthful vigour and retains all its validity. It professes eternal truths, deeply anchored in the Word of God, enunciated in a simple, extremely deep and eminently practical way. The careful reader realizes immediately which lessons, encouragements and consolations to draw from it and apply them to daily life. That is why this little book is still used in Lutheran churches around the world. It may be supplemented with other tools using contemporary educational criteria and methods, but it would be a serious mistake to replace it under the pretext that it is out of date. It is no more outdated than the truths for which it stands, and the way it communicates them is still most pertinent. You can read an older translation of the Small Catechism online here for free. You can see an up to date translation online here for free. For an up to date translation that’s easy to read, check out The Book of Concord – A Reader’s Edition from Concordia Publishing House.